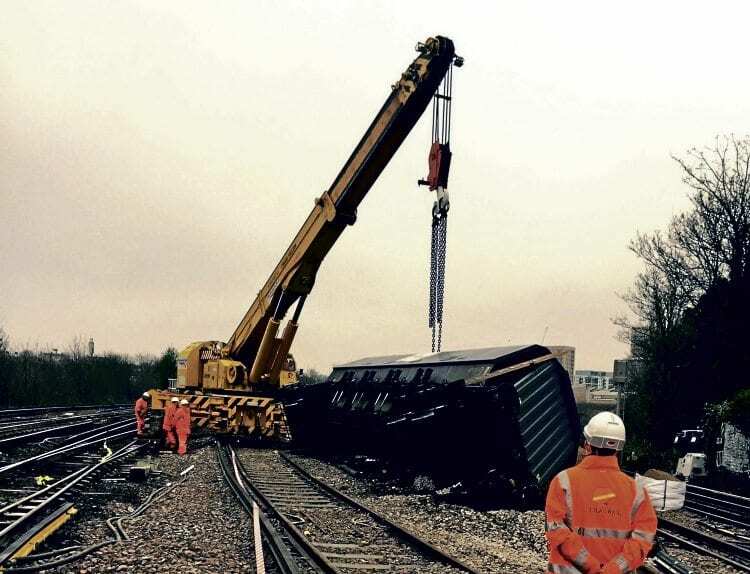 SOUTHEASTERN services were severely disrupted for six days after a loaded sand train derailed at Courthill Loop North Junction between Lewisham and Hither Green on January 24. Two of the 18 bogie hopper wagons derailed, with one coming to rest on its side, damaging around 50 metres of track and a set of points. A bespoke replacement point was built at very short notice, assisted by London Underground’s in-house factory at Lillie Bridge, near Earl’s Court. With only half the usual number of tracks available, Southeastern was forced to operate an emergency timetable, suspending all Southeastern Metro services and diverting Hastings trains to London Bridge via Redhill and Ramsgate services to Victoria. GB Railfreight’s 03.56 Grain-Neasden, hauled by 66724 Drax Power Station.